There are tentative plans in place to host a series of printmaking workshops in our space in the Jersey Shore Arts Center. My studio partner Molly Johnson (Social Animal Press) is planning weekly Wednesday night sessions beginning in mid-July and running through most of the summer. Each week she will demonstrate a different procedure and process, which those who attend will be able to try. Come to one or to all. Still working out some details on this, but if you're interested, you can find out more information from Molly at (908) 675-1746. Or send me an e-mail using the link on the right. I'll post more information on this blog when I know something for sure. In the morning I did research around the house, digging up images from the basement and from the internet. I put some of this to use when I got up to the Studio in the afternoon. The thing that took the most time was working on the left side of the third level, a mall scene. This mall is going to reflect the mall experience of my youth, and I was lucky to find a couple of photos of my home mall as it looked in 1973, back when it still had character. For example, that crazy post with the light globes- I had forgotten about that, but it's perfect for the time. And the photos will be helpful when I'm ready to color it. The escalator and architecture are my design. Still needs a little work, have to put in all the trees, maybe a few shoppers. From there I followed the movement of the escalator upward to the fourth level, the center of which is my distillation of Dempsey Hardware, my grandfather's old store. There was a trap door to the basement, and in the winter months the wood stove was a popular gathering place. As kids, my brother and I would have fun playing with the bird seed barrels, oil cans, paint chip cards, etc. And that's not even getting into the tools. This section still has a long way to go, but I did put in the trap, floorboards, and the stove (from a newspaper photo of the store, circa 1966). The barrels will be in the final version, but I don't know if these are the barrels. The store floorboards flow across to become the benches/tables in a small piece of Homer's Country School. This part is more or less done. Next time the goal is to finish the mall and the rest of the 4th level. In other news, my talk with Mikki from the Coast Star last week had mixed results. 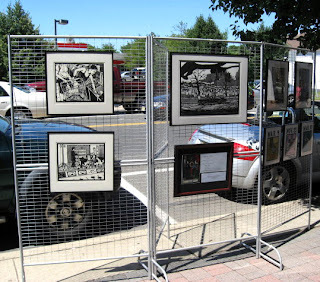 No quotes from me in her piece about the Manasquan Art Walk, but she did mention that woodcut prints were on display, and I'm pretty sure I was the only woodcut artist on the street that day. Today's session in the Studio was adding various cartoon related images to the new block. On the right side I put in Felix and Popeye. Both will be colored as black and white cartoons in the final print. When I was young sometimes we would go to a clothing store for kids, which had a little darkened carpeted side room where b&w Popeye cartoons were shown continuously. These Fleischer Popeye's of the 1930's are still favorites- the later ones are a waste of time. 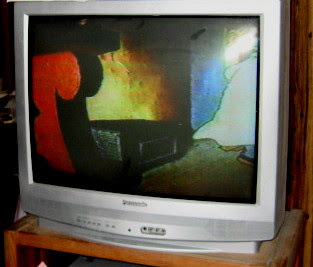 The Felix shorts I watched were likely made in color, but on my black and white tv, who could tell? But the king of cartoons for me will always be golden age Bugs Bunny. There's nothing I don't love about those 1940's Warner Bros shorts- great dialogue, music, animation, and art. And one of my favorites is "Little Red Riding Rabbit", their take on the famous fairy tale. This is a classic 1943-44 short directed by Friz Freleng. (it's up on YouTube if you want to see it, and you know you want to see it) Besides the great gags, I was always drawn to the art of this episode, especially the richly painted backgrounds of Grandma's quite large cabin in the woods. Every room seems to have intricately carved woodwork, interesting textures, and expressive shadows. And of all these rooms, my favorite is the one shown above on my tv, where the wolf passes a roaring fire, revealing that Bugs is hiding under the wolf's own 'Grandma' nightgown, ready to zap him with a flaming coal from that fire. This is one of those things that made me want to be an artist. So this location had to be part of my tower. However, Bugs is never actually fully seen in this room in the original, so I have him peeking from the darkened doorway. I also worked a few other areas- improving the supermarket scene and starting to work up the far left end of the second level. More about that later. Spent several hours up at the Studio today. I was busy, but not quite as productive as I had hoped. First, as promised, a photo of the work in progress on the building itself. Here you see one dormer has been constructed, and a second being started. I think there will also be one in the middle, then they go and put some on the parking lot side. I don't know if any will be put on the side facing east. My priority was to get something done for tonight's mural committee meeting. 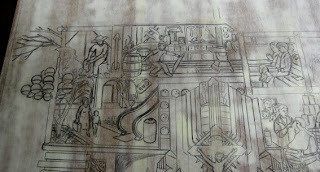 I did devote some time yesterday to looking up more references for my mural proposal. 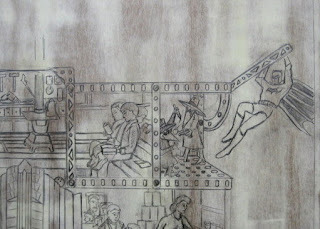 Before doing anything else today I played around with my cut pieces from last week, and the final version does show a few changes, including one addition- a figure from a pre-Columbian mural (lower left). Then I colored it with colored pencils. Unfortunately I didn't realize until I was in the Studio that I didn't have a color version of the Benton painting, so I was just guessing on those figures. My second priority today was to pick up my display racks and bring them home for Saturday's Art Walk. Figure it was better to do it today, in case I don't have time to do it tomorrow. So I packed that up on my way out, getting it all into the back of the truck just before the rain came. My third priority was to continue work on the History block, but that didn't get done. No problem, I'll just work on it next time. I went from the Studio to the Boathouse, just in time for the meeting. We looked at only two proposals tonight- mine for the north wall (which may still be combined with other ideas), and the river scene for the larger south wall. So tonight was mostly about details. 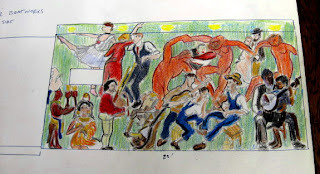 There was some debate as to the purpose of the mural- art vs. community. But it looks like we resolved everything, so things may be moving to the wall in the near future. As for my proposal, people like the color version, and it's likely to be part of the complex north side plans, but it looks like we won't be dealing with that wall until next year. Had a few hours free in the afternoon to get up to the Studio, bringing with me some reference material. 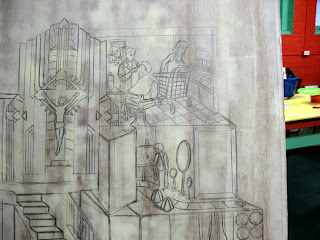 I concentrated on the area to the right of the crucifix today. I put two ideas into the lower level. The deep background is an image of painting at an easel, representing one of my earliest experiences of making art. This was nursery school, where there was a little side room for art, painting with poster paints on newsprint. A colorful abstraction, which my father framed and hung in his office, perhaps my first exhibition. Leading back there is bits from the board game Candyland, the classic 60's era design I played with, not the horrid grotesquely cutesy version they have now. Here I used the path, the lollypop woods, and gumdrop mountains. Still remaining in that area are things to the immediate right and left. The upper level is a single space that combines two key business locations- Lou's Barber Shop from Bloomfield and an unspecified supermarket. Both have figured into work I have done, especially the latter. The barbershop part is pretty much done, but the supermarket part will need a little adjusting and refining, but that will wait for another day. Got up to the Studio building in the afternoon. Took care of some business with Herb, the boss of our building. Then I got to work. The main thing today was putting in the crucifix/celestial elevator on the second level. I also started blocking in a little more of the other parts of the second and third levels. I've got a few more adjustments to make on the second level, but I think it's going in the right direction. I also need to collect a bunch of reference material from around the house before I start filling in all the details on that level. Or I can continue pushing upward with the basic structural frame of the tower, or some combination of the two. Another busy afternoon around Monmouth County. First I hauled a bunch of outdoor furniture up to my brother's new place in Hazlet. After that it was a series of steps south. Next stop was SICA in Long Branch, mostly to see the latest Fresh Meat show, the annual group show of work from new MFA students from NJ schools. I'm always curious to see what's coming out of the schools. My favorites of the 21 artists were the mixed media paintings of Ahni Kruger (from Montclair State, one of my old schools) and the installation of cast iron pieces from Gina Miccinilli. (William Paterson U.) I was a bit surprised at how many of the students were more experienced artists, with a decade or more experience as an artist before earning their MFA. Things were quiet around the gallery, but later in the evening Molly was scheduled to do an artist talk on how to make intaglio prints. SICA doesn't have a press, so I guess this will not include a full demo. From there I took the Ocean Ave through Long Branch, Deal, etc, then Main through Asbury to the Studio. I continued where I had left off with the new block. I finished drawing the rest of the bottom layer of the tower, at least the basic structures. When I previously did large complex prints, such as Employee, I worked out everything in detail on paper and did a reverse grid transfer to get it to the block. 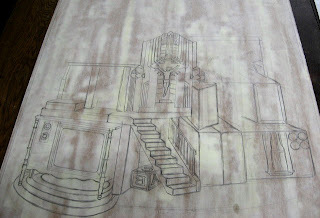 My paper sketch this time was a bit rougher, quite a few things not completely worked out, so I'm making a reversed freehand drawing from my sketch, creating a lot of the structure, inventing the transition spaces, and adjusting proportions of the layers as I go. This may allow me to squeeze in some of the stuff that got left out of the first sketch. Today's output may not look like much, but it's the result of considerable effort. Left the Studio around 7:30, and followed Main down to Belmar, stopping at the Boatworks. An e-mail earlier today from the BAC mentioned that they'd like to see the next round of mural proposals to exact scale. 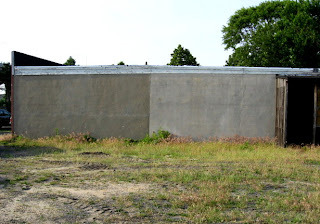 The south side wall is an even rectangle, but the north side (where my piece would likely end up) includes different sections, with a window, door, and garage door. I brought a tape measure and made notes about all the measurements of this more irregular wall. 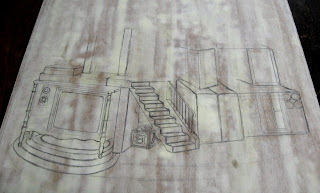 Sometime in the next few days I'll do my scale drawing of the wall, then figure out how to make my idea fit it. 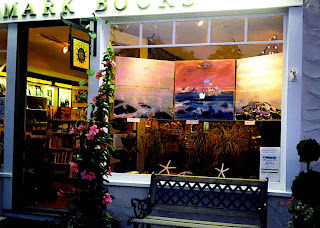 It took a week longer than expected, but I finally got word today that I am officially part of the upcoming Manasquan Art Walk next week, 11 am to 3 pm on Saturday June 23. (weather permitting of course) I won't know my exact location until that morning, but if you want to come looking for me, all the artists will be set up on the sidewalks of the downtown area of Manasquan, on Main Street west of Route 71/Union Ave, going a little past South Street/Broad Street. 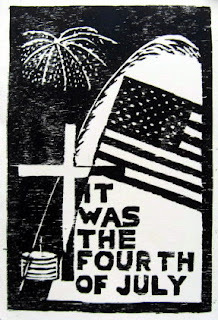 It's a pretty good bet that I'll have the only woodcuts out there. Off work today. On my list of things to do today was to call John Lustig, fellow Saluki and curator of permanent collections at Indiana State. The purpose of the call was not art related, but we got onto that subject eventually. The thing of interest- he's planning a large print exhibition in the near future and would like to feature a lot of SIU alumni, me included. More on that as it develops. 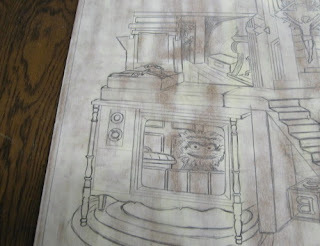 My art plans for the day were to produce a sketched proposal to bring to the BAC meeting tonight. I stopped by the library first to look through the books of vintage photos of Belmar and make photocopies of some possibilities. Not necessarily the way I wanted to go with this, but the idea of including a scene like this was very popular last week. From there I went to the Studio, lugging a bunch of art history texts with me. I had some definite images in mind, but to give myself the most options I went page by page through all the books, over 2500 pages in all, bookmarking possibilities. In this case, I was looking for paintings through history of people playing music or dancing, two subjects related to council programs. 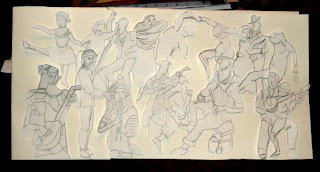 The next step was to go back through the marked pages and do quick pencil contour sketches on paper of the various figures. These were cut out and arranged, then taped down, as seen above. 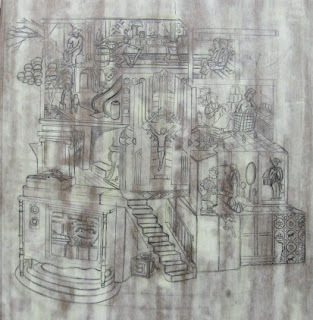 This concept prototype includes one from Egypt, then figures from such artists as Degas, Bruegel, Renoir, Picasso, Munch, Benton, Tanner, and Matisse. My original plan was to produce something with color for the meeting, but I ran out of time. Never got to use the photocopies. Went straight from there to the meeting in Belmar. There were a number of proposals, all having merit. It looks like the big south wall may end up a scene that includes sky, bridges, etc (including some plywood construction) above, and a colorful underwater scene below. The advantage of this one is that the underwater part would lend itself to some community involvement. Another proposal was an extremely ambitious and interesting concept that would involve both wall painting and many 3 dimensional elements (involving mannequins and other items). Elements of that one will likely appear on the other (north) side of the building. My proposal was also well received. 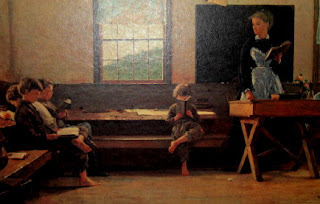 People like the concept, the mix of figures and movement through the composition, although the skill required would make this one difficult for community painters. Still, there is enough interest to have me do a full color rendering for next week. This would also likely be on the north side, maybe combined with some of the 3D elements. More details next week. Got up to the Studio for a while in the afternoon. I ended up on the phone for quite a bit of that time, but I did get some work done on the new block. I drew the border first as usual, then started drawing the tower itself. Today I began with one of the corners of the base layer. This corner happens to be the television of my early years, a 1965 Zenith b&w console model, which remained the main tv in the house until around 1974. I did see color tv occasionally at the homes of friends and relatives, but most of my early tv viewing was black and white. Sometimes I wonder if my interest in black and white prints comes out of this early way of looking at the world. I'll put a picture on the tv screen some time before the drawing is done, but that's a long way from here. 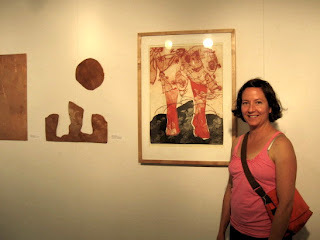 Today was the opening reception for the Process Exposed show at the Printmaking Council of NJ. The goal was to show the steps involved in making a print, from sketches through plates/blocks through proofs to the final print. 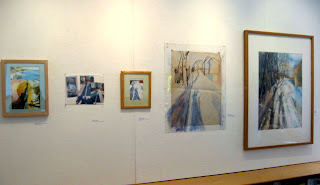 (kind of like this blog) Print media represented include mezzotint, etching, linocut, monotype, solarplate, silkscreen, woodcut, and a variety of monotype and mixed media. About half the artists are from various parts of NJ, with the others coming from other parts of the country and Canada. 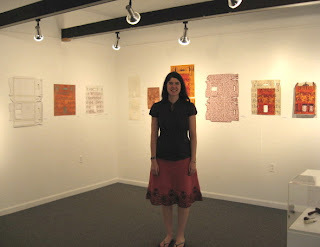 Of the 11 artists in the show, 3 showed up for the reception. I gave Molly Johnson a ride up from the shore, and Sandra Murchison and Jason Watson were also in attendance. Nice days like this sometimes hurt attendance, but we did ok. Shown above are a few samples of the art in the show. 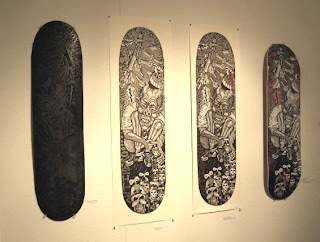 From top to bottom- linocut print/skateboard design by Dennis McNett (NYC), monotype from Sandy Taylor, mixed-media etching piece from Julie Harris, Sandra Murchison (Mississippi) in front of the 9 pieces that make up her contribution to the show, and Molly by her final product. The art not shown here is pretty good, too. 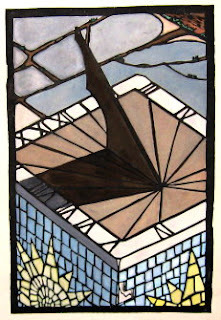 See for yourself at the Printmaking Council through July 28. Took care of some other business as well. I renewed my membership for another year, and dropped off the print I packaged a few days ago. The purchaser showed up while I was there, so I told her about the story behind it and the print itself, as well as giving some advice as to how to frame it. After that I drove Molly back home and then went home myself. Earlier tonight at the Belmar Arts Council we had a presentation relating to our big community public project for this year. We have been granted use of this building, a former boatworks, to function as our headquarters, meeting space, gallery, etc, at least until redevelopment comes to this block. You've seen inside views before. 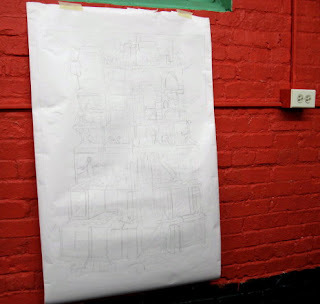 The plan is to paint a large mural on the long side of the building, which will be very easily seen from the passenger train that goes by about 30 times a day. We also think it will help bring people to visit our slightly off the beaten path location. We had been asked to bring ideas to today's meetings, although we had been given not specifics as to what the mural would be about. Being an arts organization, I'm thinking subjects related to the various arts we are involved in, along with things related to the town itself. So I did briefly spend some time this afternoon looking at some books, but didn't have time to work anything out. Guest at our meeting was Bob Mataranglo, a versatile local artist who is known by some for his murals- in fact he did a presentation on the topic at one of our meetings a few months ago. He won't be painting this one, but will give us advice as to how to go about doing this. 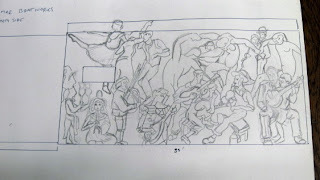 Also at the meeting there was a lot of discussion about what the mural should be about, and there was no consensus. We'll have another meeting next week and this time we are to bring visual plans of our specific ideas to discuss and vote on. I plan to put something together to present to those who show up, and at least try to influence the direction of this thing. 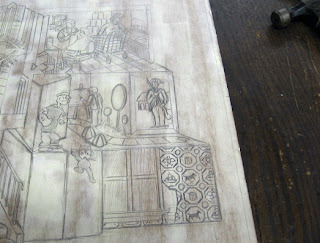 I got up to the Studio in the afternoon, with the primary goal of working on the new History print. Today I prepared the piece of wood. I have this 2' x 4' sheet that I bought a few months ago, with the hopes of using it for a portrait project that has been put off for a while. It's a pretty smooth sheet, but I decided to surface it anyway. 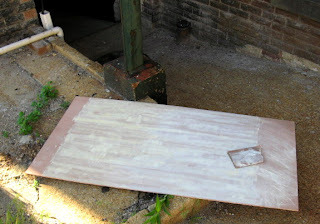 I applied the stuff inside, but took it to the back steps outside my studio to do the sanding. I usually take the blocks outside to sand, especially when they're large like this. The material is not particularly toxic, but I still don't want to be breathing a lot of it in, or even having to clean it up. If you look carefully (click on it to see it bigger), you'll see the difference between the unsanded left side and the sanded right side. Another project was packaging a print for sale. Last month PCNJ held a fundraiser event at which they auctioned off one of my prints. I recently learned that in fact it had gone for almost $100 over the listed value after some competitive bidding. I wondered if this meant that there would be further demand for the print. Didn't take long. Over the weekend I got a call from Susan at Riverbank Arts, a gallery in Stockton that has some of my work for sale, something I mention on my website. She said a customer was looking to buy that very same print, and asked if I could get one up to her. Further investigation revealed that the interested party was someone who had seen it at the auction, so we thought it appropriate to handle this through the Print Council. So I'll bring it with me to the reception this weekend, and the buyer can pick it up then or any time after. And speaking of galleries, I took a time out to stroll over to Asbury and check out one of the newer galleries in the Cookman Ave area, a place called Crybaby Gallery. The place focuses on lowbrow high quality art. 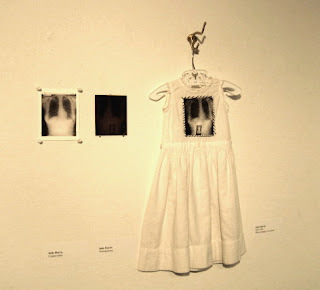 A lot of tattoo influenced imagery in the current show. The Outlaw Printmakers would definitely be at home here. Then back to the Studio to spend a little while going though art books looking for ideas for a mural, but more about that in the next post. It's been a long day and art has been a part of it from end to end. First thing in the morning I was online, and as part of that, printed out a copy of the guidelines for the NJ artist grants. Also verified the times and dates of the workshops. Next thing was going downtown to drop off the application form for the Manasquan Art Walk on June 23. I had to wait a few minutes for the chamber of commerce to open up, but then it was just handing over the form. I was told that I'll likely be officially notified this Friday of my acceptance, and I may learn ahead of the event where I'll be setting up my display. If I do find out anything ahead of time, I'll post it for those who want to come looking. After that I was at my day job for the usual deal. As it turned out, we had enough people working today that I was able to leave early so I could get to Red Bank in time for today's information session/workshop at the Two Rivers Theatre Company. I walked into the room to see only two other people sitting there. These turned out to be fellow works on paper applicant Erin Marie Dunn (no prints, but you can see her drawings and animations on her website) and her mother. Last time I went to one of these we had like 30 people. I blame the low turnout on the 3:30 start time and the very short notice. The good thing was that we got a presentation tailored specifically to the needs of our category. Part of today was a screen by screen presentation of the application procedure, during which pretty much all the questions I had about the image uploading were answered. Learned about some of the other new features of the online applications as well. I'm much more confident about using the system now. After things finally finished up at the workshop, I fought my way out of the Red Bank rush hour traffic and headed home. Waiting for me was the usual assortment of mail, traditional and electronic. Years as an artist get you on a lot of lists. Postcard for a group show at a nearby gallery. Newsletter for an artist colony I attended once. Renewal form for membership in an arts organization. Information about the series of workshops I just attended today. Reminder of a meeting of a local arts organization tomorrow. Stuff from people at the colleges I work at. I did nothing today relating to the making of any artwork, but I took care of a lot of art business. 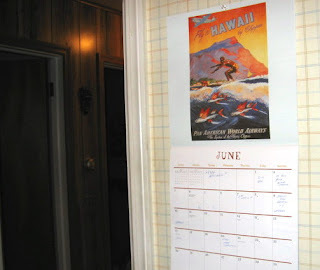 Late last night I was on the computer, and having glanced at my calendar (yes, that's genuine wood panelling there in hallway in the background), I was reminded to check the Mid Atlantic Arts Foundation website again to see if they had posted the information yet for this year's grant applications. The good news is that it is finally up. But to add to the challenge, this year everything must be submitted digitally. I'm sure that this is supposed to be good for the artists (shooting digital is much simpler than the slides we always submitted before), and obviously I am no stranger to the digital shooting/uploading. The problem is that they have some very specific requirements that I'm not sure I can accomplish with the camera and software I have. So I decided to test this by taking a test shot with the right pixel count, then see if at least the file size was ok. Second problem- for unknown reasons I could not get the software to download the image from the camera. Checked and rechecked all my connections, switches, etc, restarted the software a few times-- nothing. By this point it was about 2:00 am and the last thing I needed was to get more agitated (I had to be up by 7 am today for work), so I shut everything down and went to bed. This morning before work I fired up the computer and tried things again. This time the software was working and I did what I needed with my photo. At least the file size thing is ok, assuming I understand the instructions. The good news is that there are workshops scheduled around the state to help us figure all this out. The bad news is that the one closest to me turns out to be tomorrow afternoon-- not much notice and I may not be able to leave work in time to get there before it's half over. 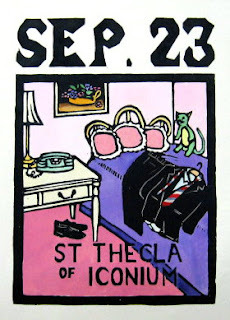 If tomorrow in Red Bank doesn't work, I'll go for the one at the Noyes Museum in Oceanville in a few weeks. It's an hour away, but it's in a scenic area and it's a chance to see that museum for the first time. Back to the Studio today to work on the piece that is now officially titled "A History of Art". This is the print that has been referred to as the Tower project going back to mid-April. It's reached the point where it's time to talk about it. The original inspiration came in a classroom, watching my students work. The first image in my head was a bunch of artists all working on a massive artwork made up of bits of historical work piling up, especially my personal favorites. The idea evolved a little over the next few days. The image of many small figures working on something massive brought to mind Bruegel's painting The Tower of Babel (I had been looking at him a bit lately when working on my Employee print) , so that became my model. And it became less about the general history of art, and more about all the things that influenced me as an artist. The title is about my history with art, which includes some examples of fine art, but also commercial art/design, pop culture, architecture, plus some of my early creative impulses and outlets. To do justice to the idea this print has to be big, so it will be 36" x 24" (same as Employee, but vertical instead of horizontal), and unlike my other large prints, this one is intended to be colored. It's organized with the earliest influences on the bottom, with later ones building on top, just as the tower would be built. 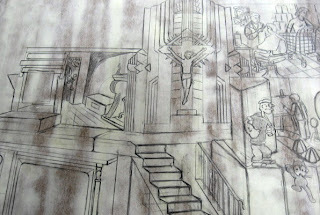 And like Bruegel's, mine will narrow a bit as it moves toward the top, but not be completely symmetrical. (An artist's path through life tends to be a bit irregular.) There are 6 or 7 levels, plus stuff on the ground in front, in the background, and in the air. 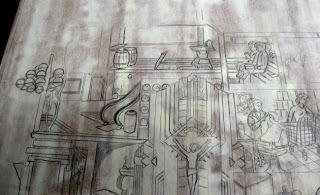 Today's work was adding the top layers to the piece in this large rough sketch. I'm sorry that there's not much to see in this form (the main reason I haven't shown any of it before now), but things will be clearer when I start the drawing on wood. There's a lot of details to be worked out, reference material to gather, and I'd like to see if I can find room for some of the many things I had to leave out, but I am hoping to start the block drawing by the end of the week. Always a lot to do on days I don't go into one of my jobs. One of my tasks today was to look into the upcoming Manasquan Art Walk. They did one of these last summer, where various businesses on Main Street had local artists hang artwork in their windows for a few days, with one evening set aside for little receptions at each location. I was sort of a participant. 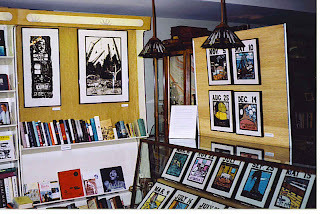 The top photo shows the front window of the former Landmark Books, with a triptych of paintings by Stephen Zorochin, while inside there was a show of about 40 of my prints displayed around the store on walls and in cases, as you see in the second photo. They are doing two more events this summer, the first in about 3 weeks, and so I dropped by the chamber of commerce to investigate. It's going to be a little different this year- instead of hanging artwork in the windows of businesses, all artists will be displaying their work outside of the stores. That means I would have to bring my display racks and stay with the art for the whole 4 hour event. I need to check my calendar before I submit my application. From there I made a quick run up to the Studio, going inside just long enough to grab my rolled up sketches for my tower project, then down to Belmar to open up the BAC building for planned gallery hours. I knew I'd have a lot of time to myself, so I used the quiet time to advance my tower sketch a little bit. 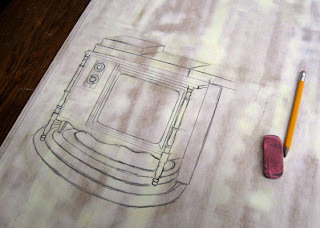 I'm hoping to be ready to start drawing on the block itself by the end of next week.